According to Federal Trade Commission (FTC) Amazon’s apps make it too easy for kids to purchase virtual games with real money within game apps. They are costing their parents enormous amounts of money that parents only see once they receive the bill. The FTC believes that Amazon is allowing this to happen costing account holders hundreds of extra dollars at a time. There is a lawsuit against them wanting all customers to be refunded for their children’s mistakes. They claim the Amazon app does specify what is gaming with virtual money from buying with real money. Amazon makes around 30 percent in revenue from these gaming apps. Amazon’s associate general counsel, Andrew DeVore, wrote to FTC Chairwoman Edith Ramirez. Amazon argues that its current practices on in-app purchases already meet the conditions outlined in the Apple settlement. “In-app purchasing was and remains a new and rapidly evolving segment, and we have consistently improved the customer experience in response to data”. In 2012 they did establish that any purchase over $20 must require a password but it just stays on by default. Why it’s Hot: I find it interesting to why Amazon just did not put a password on the app every time you buy something. That way kids cannot just go on their parents phone and purchase random gaming apps. Many Amazon account holders are being charged due to this issue which gives customers a negative perception of Amazon. Overall it will be interesting to see how Amazon reacts to this lawsuit and what the outcome will be. Mattel Canada unveiled a well-dressed, cellphone-toting version of its iconic doll — called Entrepreneur Barbie — in Toronto on Wednesday (Harris, 1). 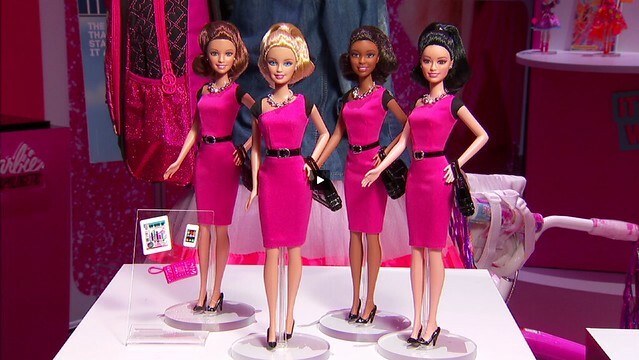 Entrepreneur Barbie wants to inspire young girls to follow their dreams and maybe one day to become their own boss. She wants to be looked upon as a role model by showing young girls that anything is possible. There is already a large number of Women Entrepreneur’s that are supporting and contributing to this Barbie; leading Erica Diamond as the Chief Inspirational officer. That is not all that Barbie is promoting! Entrepreneur Barbie’s Business Bursary Program is offering $2,500 cash to three females under the age of 18 that want to start their own business and present the best idea. Barbie is dressed in a hot pink business dress and includes smart phone accessories, brief case and a tablet. There is controversy about Barbie’s outfit by not wearing a suit it becomes unclear of what type of company she is running. Diamond makes no apologies for Barbie’s attire. “She’s in a dress because we know that entrepreneurs don’t have to be stuffy,” she said. Why it’s Hot: Barbie is seen as the primary girls toy and has ranged from many different careers from police officer to rock star. This doll focuses on targeting young girls and making them believe they can achieve anything they want. The main focus is to make this Barbie boost girls’ self-esteem and increase parental approval by the profile on LinkedIn. They are trying to change the perspective of a Barbie doll by making it more appropriate to this generation. Every year there are an enormous amount of plastic bottles that are wasted even if they are recycled. This is ongoing problem and we need to discover a way to turn that harmful waste into something that can help the environment. The Ekocycle 3D printer uses filament made from post-consumer plastic bottles. Will. I. Am who is known as a music producer is the chief creative officer of this printer has teamed up with Coca-Cola to launch this new technology. So far there are only a couple of colors you can print red, black, white and natural colors but in the future it can be expected to have a wide variety. It is expected to launch sometime in 2014 and has a retail price of $1,199. Their future goal is to “partner with the most influential brands around the world and use technology, art, style and inspiration to change an entire culture. We will make it cool to recycle, and we will make it cool to make products using recycled materials,” as explained by will.i.am. Why its Hot: I think it is interesting how technology is constantly growing and in the midst of it we are finding ways to make it eco-friendly. Once people find out about this 3D printer it will become very popular and hopefully in the future accept other plastic bottles as well. It will be a growing trend by as Will. I. Am stated ” We will make it cool to recycle, and we will make it cool to make products using recycled materials”. Last week Facebook released a new mobile app called Slingshot which can be used on IPhone and Androids. Slingshot lets you instantly share what you are doing with a group of friends. First you shoot a photo, short video or a selfie, add some text or an emoticon or draw on it, then “sling” it to a friend or friends The catch is that your friends can not see your picture/video unless they send a picture/ video back to you. Overtime Facebook hopes that their app Slingshot will help take away some of the popularity from Snapchat and increase the social interaction between younger users. You do not need a Facebook account in order to join Slingshot all you need to provide is your phone number. Why it’s Hot: It will be interesting to see how this app competes with Snapchat once users have discovered it. Whether it will fail to compete with Snapchat just like Facebook first attempt of the messenger app “poke”. Facebook hopes that Slingshot will eventually increase social interaction amongst younger users because it encourages users to be creative and neglects you from being a passive spectator. Everyday people who smoke cigarettes seek new methods on how to successfully resist their nicotine addiction. The overwhelming craving is too much to be able to quit “cold turkey”. U.S. based Chrono Therpeutics has designed a digital, wireless device called SmartStop which takes nicotine replacement therapy to a new level and adds behavioral support. SmartStop is an electronic device which includes two parts; a reusable base which can be worn on the arm, wrist, or torso, and replaceable nicotine cartridges. The main idea is the devise can be programmed to automatically satisfy peak nicotine cravings in routine or heavy smokers. The devise has behavioral support by sending messages of encouragement, friendly reminders and provides awards and incentives as the user overcomes their addiction and finishes their therapy successfully. The device utilizes Bluetooth technology, the user can uplink to an app on their smartphone which prepares real-time guidance to help with the therapy. “The average smoker will attempt to quit eight to ten times in their lifetime, but clinical studies show the timed SmartStop approach increases the success rates to about 50% compared to other methods” (Chrono Therapeutics). Why It’s Hot: According to the Center for Disease Control (CDC) in the U.S. there are on average 45 million people who smoke cigarettes and 70% of them would like to get rid of their nicotine addiction. With the SmartStop people have a much better chance of quitting cigarette smoking than compared to nicotine gum and patches. By overcoming the nicotine addiction people will save money and improve their health which can save their life. Nowadays people are constantly trying to quit smoking and with this device you are able to digitally program the time your doses of nicotine in response to the cycle of your cravings. People are overcoming their addiction to nicotine without even realizing it due to the device adjusting to the delivery of nicotine into your system automatically.